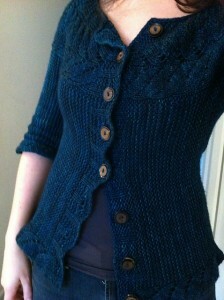 After another fun and successful KAL I have to share one of the most stunning sweaters I think I’ve ever seen! Marianela knit the Vine Yoke Cardigan by Ysolda Teague in Madelinetosh DK (colourway is Cousteau) and it came out absolutely perfect. 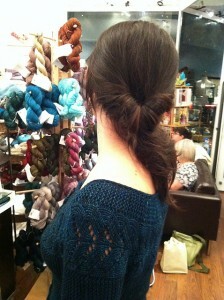 The vine pattern in the yoke is such a pretty detail to a sideways knit garter pattern. Not to mention she managed to make it fit like it was knit just for her (which I suppose it was but still, a feat to be accomplished). 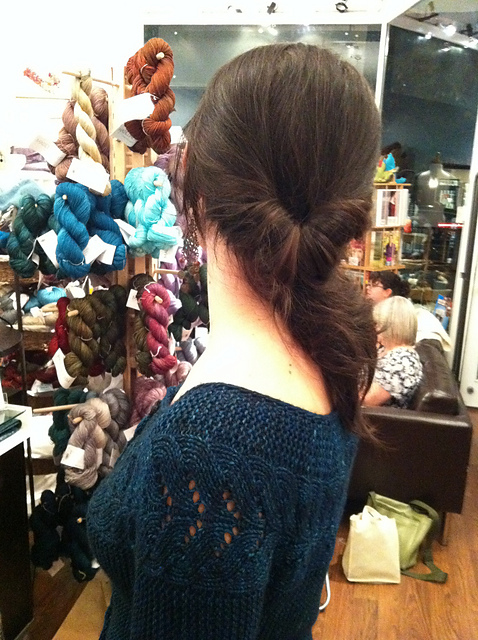 Ashley is also working her way through a Vine Yoke Cardigan and we can’t wait to see it on you! PS. I don’t know why but I ALWAYS want to type yolk, instead of yoke. It’s an involuntary compulsion. This entry was posted on Friday, October 21st, 2011 at 1:01 pm	and is filed under Uncategorized. You can follow any responses to this entry through the RSS 2.0 feed. Both comments and pings are currently closed. 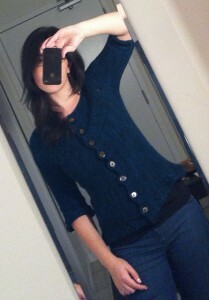 What a gorgeous sweater – the colour and the fit are perfect.